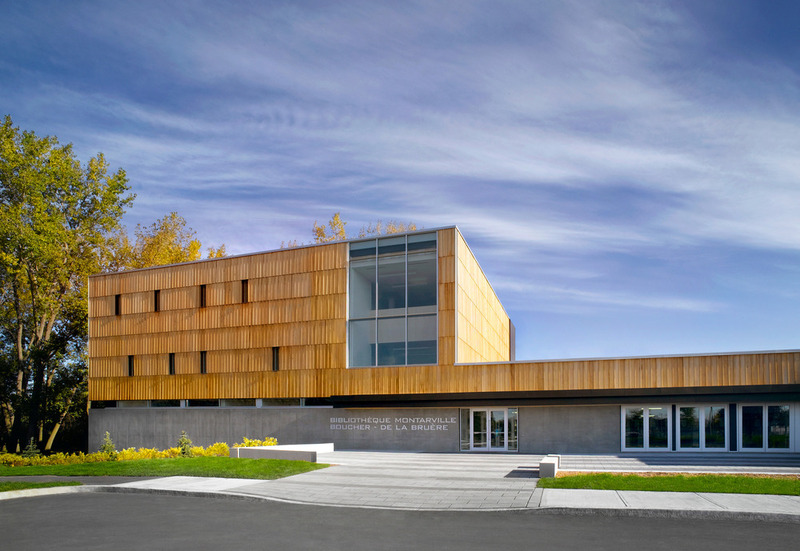 The Montarville – Boucher la Bruère Public Library is located in the downtown core of Boucherville, a town of 40,000 situated on the banks of the St. Lawrence River just east of the Island of Montreal. Built more than 25 years ago, the municipal library needs to expand and reconfigure its existing facilities so that it can better pursue its mission and provide services in accordance with new and emerging social, cultural and technological trends. This project, which was the award winner in a 2007 architectural competition, consists of a three-storey expansion (1,470 square metres) plus an indoor renovation and refit of the existing structure (1,700 square metres). It includes an atrium, a new entrance hall, a new library promenade, a new loans counter and a complete reorganization of all the library collections. 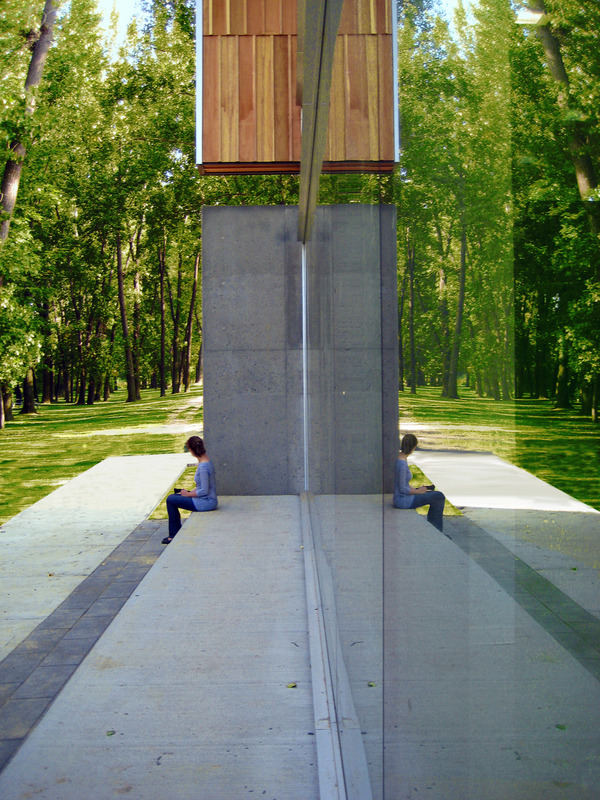 After an initial assessment of the library’s current context, it was the untapped potential for a visceral connection to the wooded area in the adjoining Rivière aux Pins Park that was the stimulus for our conceptual approach and further development of that idea. 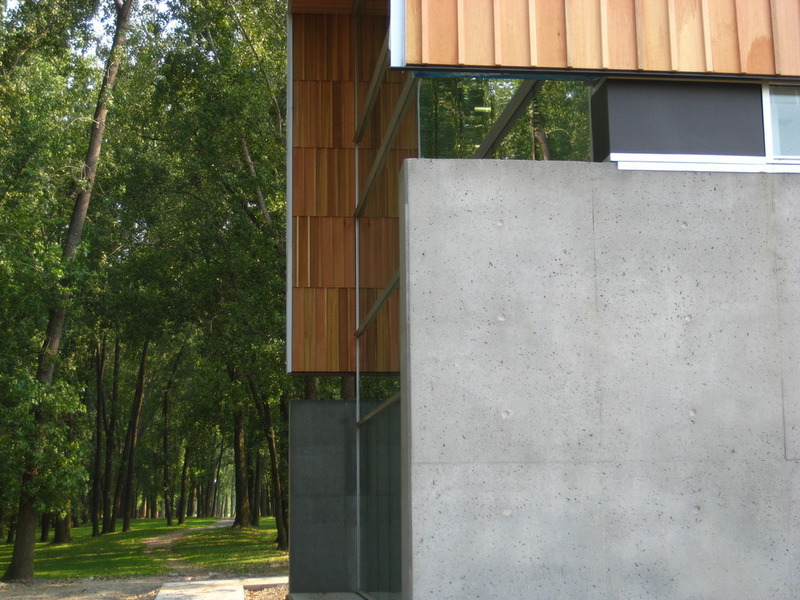 In contrast to the existing building, whose introverted geometry suggests only the slightest relationship with its immediate social and natural environment, our approach adopts an open, barrier-free design that we believe will convey the very essence of a centre whose essential function is discovery, as well as openness to knowledge and to the world. 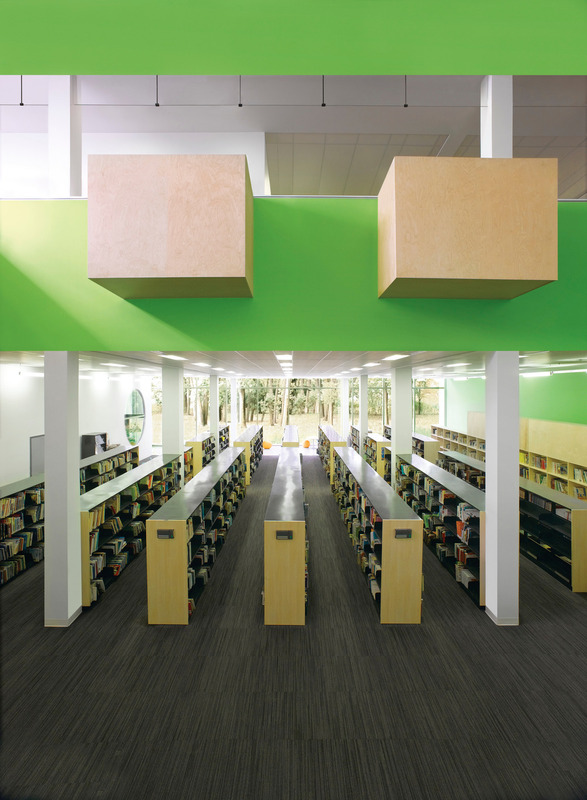 An expansion that is simple, open and effective, to the benefit of all library patrons. Given the opportunity to emphasize and highlight the adjacent woods, the library expansion project offers, in terms of its implementation, its architecture and its three storey volume, a formative gesture that defines the landscape and encourages visitors and users to come to the library. 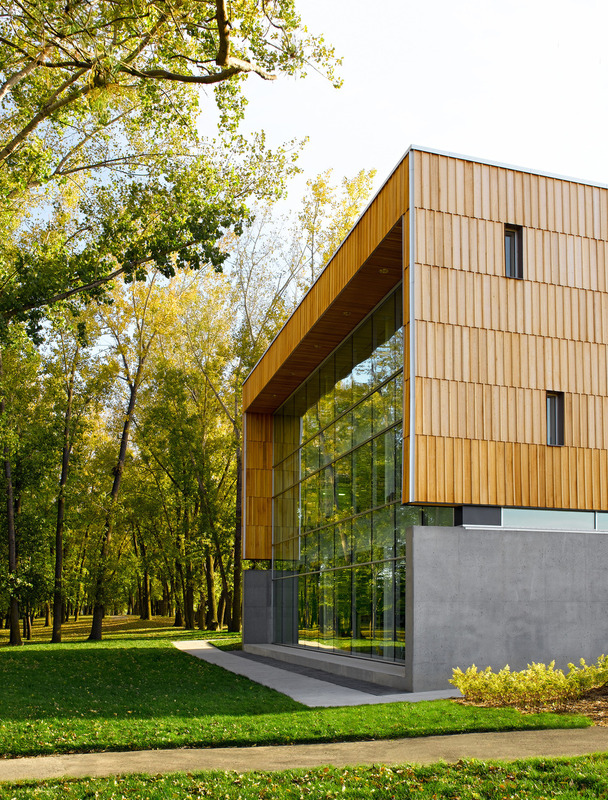 Like a unifying link, the expansion pulls together the component parts, giving concrete expression to the new physical and visual elements that connect the library to its urban context and the Rivière aux Pins Park. Inspired by the formal logic of the existing building (four similar squares that revolve around a central core), the expansion suggests for one of these squares a shift in emphasis and an opening up to the nearby woods. 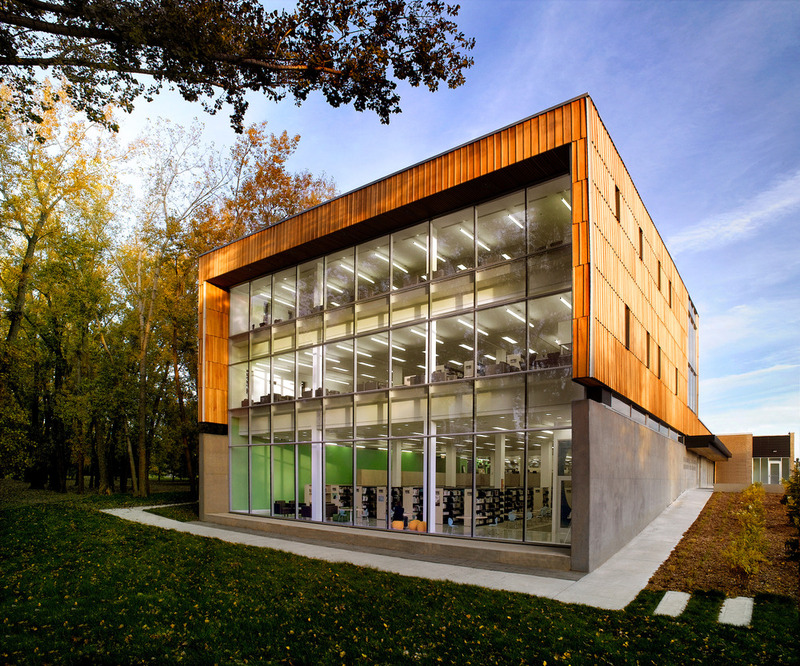 This establishes new, open-ended connections between the building and its surrounding environment, redefining the heart of the library and ensuring a comprehensive unity, integrating the existing building with both the new addition and the adjacent woods. In that sense, the two main elements that give structure to the landscape and clarify its harmonious integration are a large wooded area completely open to nature and a new library promenade, a formal exterior pathway that runs through the entire site. 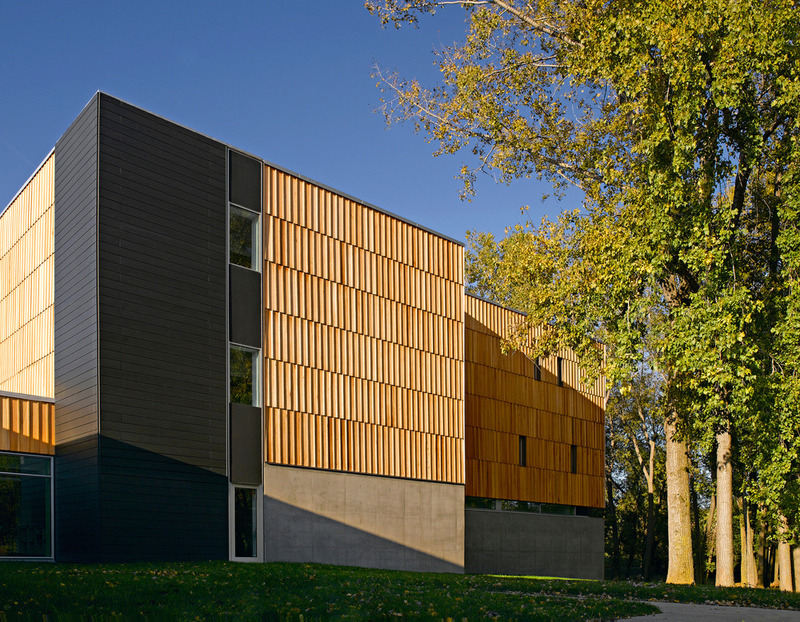 The woods are an identifying element visible from the street and the surrounding area, heralding the presence of a cultural institution in an urban landscape. 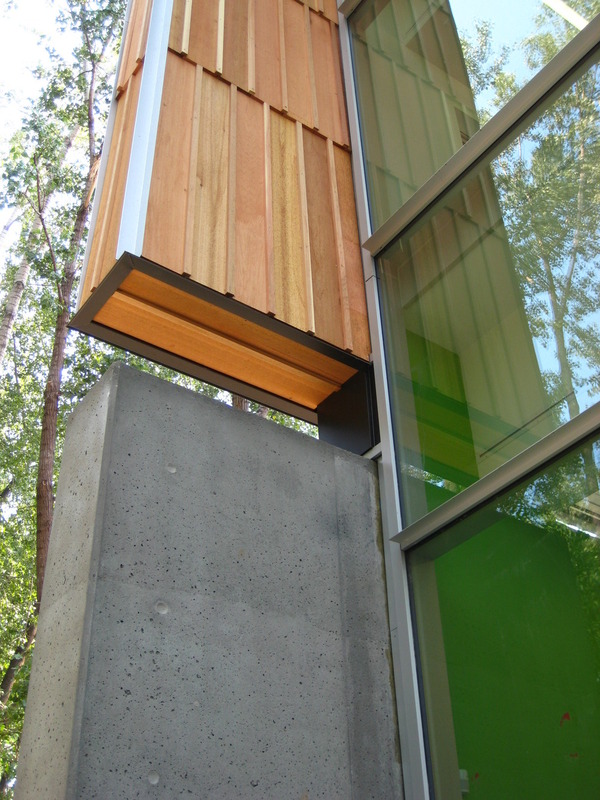 The three floors of the new extension, in addition to reducing the actual building footprint at ground level, mean lower costs and preserve as much as possible the trees adjacent to the building. The three storeys are home to the library’s three general collections – books for children, adolescents and adults. 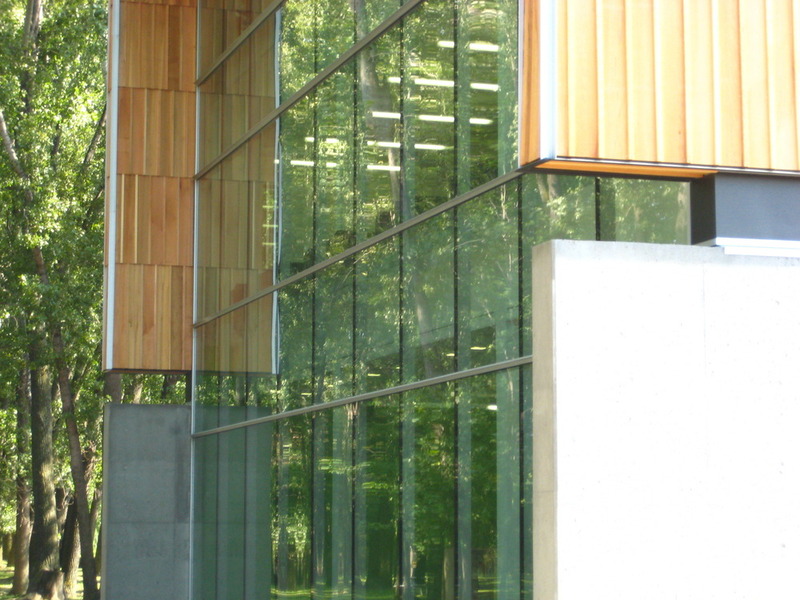 Taking advantage of the natural topography of the site and of the proximity of the trees, a large three-storey glass wall allows for diverse visual links between the indoor spaces and the woods. Consequently, each clientele (children, adolescents, adults and senior citizens) benefits from a distinct relationship with the vegetation, the trees and the foliage, which inspire calm, silence and rejuvenation. Directly linked to existing footpaths, the new promenade runs alongside the building. It follows the contours of the topography and directs visitors toward the new reception area and main entrance, thereby anchoring the library to its immediate context, its neighbourhood and its town. Taking maximum advantage of the sunshine from the building’s southern exposure, the promenade organizes pedestrian access and traffic throughout the site. 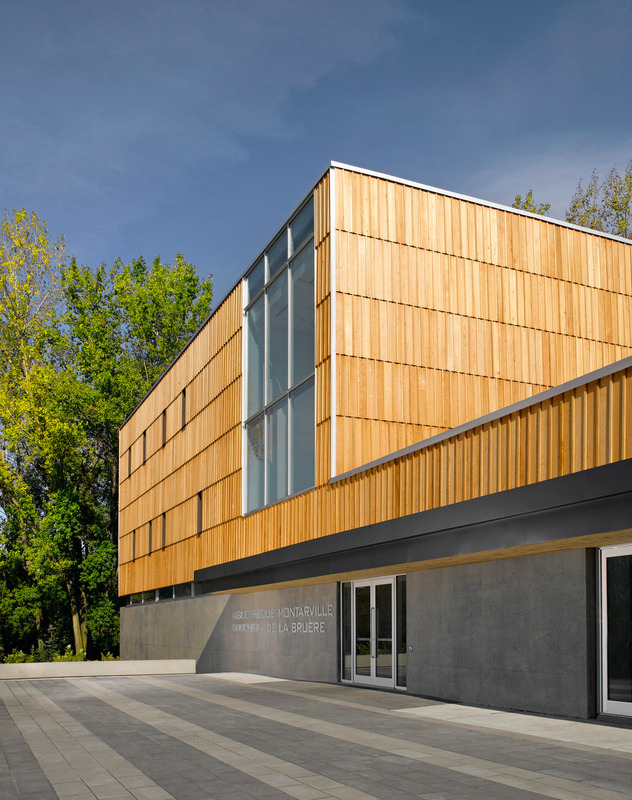 It serves as an efficient physical and visual link connecting the various component elements – the main entrance, the multipurpose room and adjacent terrace, the service entrance, the two parking lots, the woods and the river and two nearby roads (Chemin du Lac and Rivière aux Pins Street), as well as the residential sector, two parks (Parc de la Mairie and Pierre Laporte Park) and Boucherville’s old historic centre. In response to the introverted organization and the constrictions of the existing indoor space, we opted for an open spatial organization that is centred round the new lobby. With its loans counter and its atrium, it is the veritable heart of the project. Positioned between the old and the new and extended vertically via the atrium, the lobby is a central locus that allows for quick, clear identification of the main sectors of the library. The new reception area sets the tone, facilitating orientation and serving as a point of reference. As soon as visitors enter the building, they are literally plunged into the imaginary world of children. 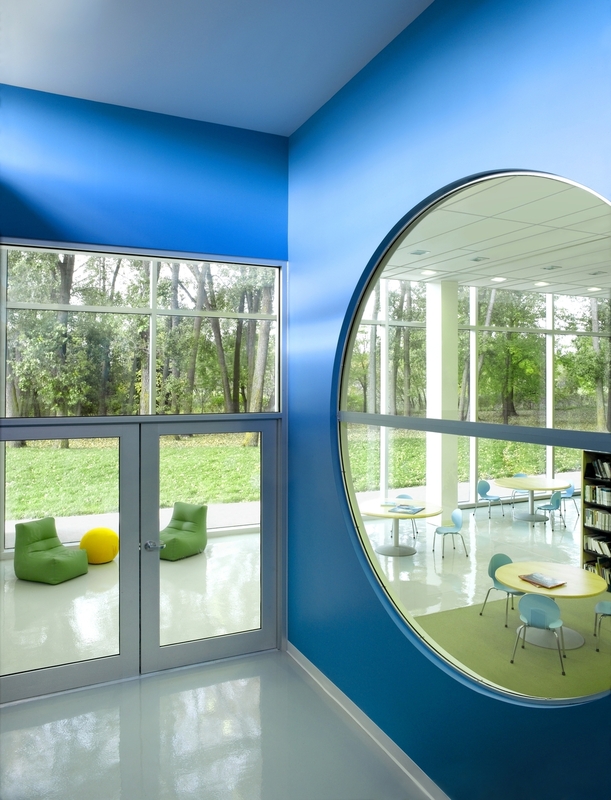 Located just below the entrance, the children’s sector offers a direct view of the woods from the lobby and the reception counter, and from the library sections located in the existing structure. Visible throughout the atrium, an access ramp serves as a continuation of the lobby and leads to the children’s section, the main staircase and the elevator. It is a veritable architectural promenade that serves both as a transition between the various sectors and as a place to discover the entire library. These comings and goings offer other visual perspectives of Rivière aux Pins Park, thereby enriching the journey from one floor to the next. 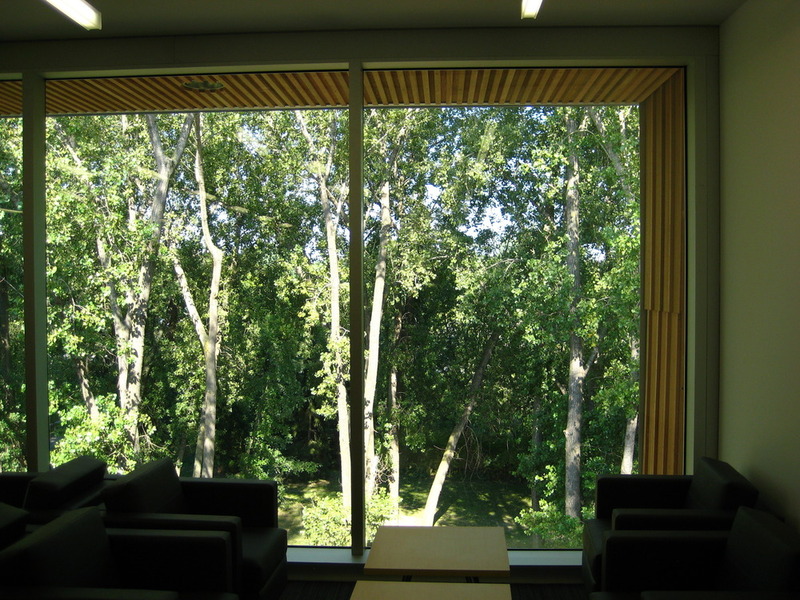 The various sectors (periodicals, audiovisual materials, children’s/adolescent/adult sections) benefit from new reading areas that have a visual connection to the adjacent woods. The history, genealogy, documentary and reference sectors are located in the existing building near the loans counter and information desk. The administrative sector is located nearby, ensuring optimum supervision and control. The main lobby, the multipurpose room, the technical services and the administrative offices have all been relocated so that they have a direct connection to the library promenade. Relocated to the front of the building, the reception and library service areas will become intermediary spaces that make the vital connection between reading and urban life. Reflecting its educational vocation, the new library’s use of wood, its big open spaces with views of the outdoor landscape and its geothermal heating system convey respect for the environment and pride in our culture. 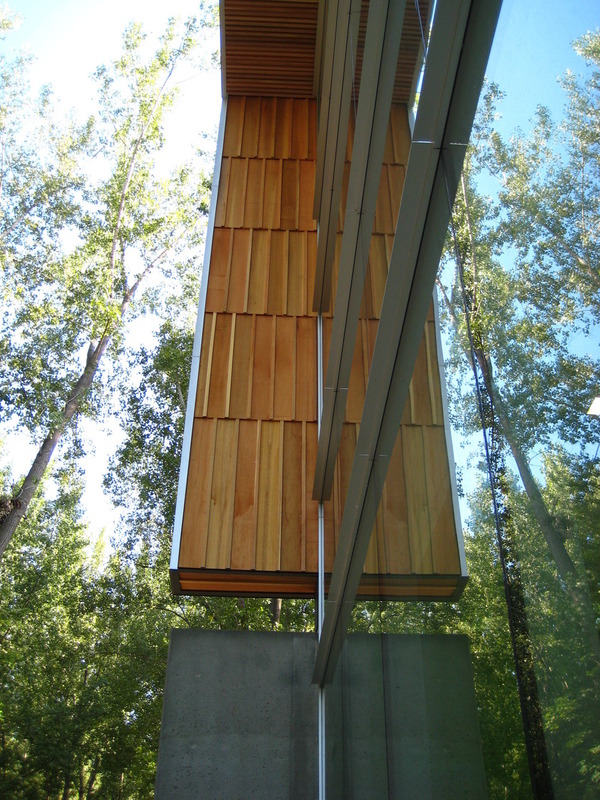 In addition to reducing costs, the use of wood (untreated natural cedar) and conventional planks-and-strips siding ensures a smooth transition from the existing wood-and-brick building.